I would love to take full credit for this but that would be dishonest. Besides, I’ve been behind plenty of other pranks to earn myself acknowledgement of some sort. But not for this prank. No, this was thought up by some mischievous masterminds and it took quite a bit of planning. It only worked because everything happened to fall right into place. At our salon everyone is very close and we all get along very well. In other words, we harass each other and treat each other like brother and sister and it’s amazing we ever get any work done. I think we all know how truly fortunate we are to say we work with our friends. So needless to say, the pranking doesn’t just happen one day a year. Whether it’s a gag or someone popping out of a box we’re constantly laughing. Oh, and we’re completely professional and do amazing hair. This must have been eight years ago when one of the senior stylists who always jokes swore he was going to get these two girls for April fools day. He was telling everyone that he was planning this ultimate prank and they would never see it coming. So instead of the two girls being consumed with trying to figure out what he was planning they did the opposite of what he intended and narrowed their sights instead on pranking him. Now things were getting interesting! Here we have Mr. Loudmouth shouting “I’m gonna get you!”and the Silent Sisters acting nervous but all the while whispering their plans. There was so much tension! Over the next couple of weeks we had unwillingly been forced to pick sides. You were either with him or you were with them. Anything that was discussed concerning April Fools day had an agenda. The best part was no one was really clear on what was happening. There was so much misinformation floating around. On April 1st everyone had their guard up. With all of the different fake prank plans that had been leaked no one knew what to expect. Our senior stylist who started all of this even went to the extent of parking his Jeep across the street from the salon so he could keep it in sight. Everyone was buzzing around, staring at each other, waiting for something to happen. The salon was so busy that day. It was like our managers were trying to make us focus on work by booking so many appointments. We were so over loaded that we completely forgot about the prank that was supposed to go down. But then we saw it across the street. Everyone stopped what they were doing as one by one the colorists and stylists walked to the wall of windows. No one said a word as we waited in silence for his reaction. The senior stylist stood there in shock looking at his Jeep. This little joke may have gone too far. These girls may have taken funny and pushed it to offensive! His Jeep, his beloved Jeep was now adorned with glittery golden naked lady trucker stickers. Not one or two, but they were on every window in every corner. Some were small and some were huge but all of them were awful! Then to let everyone know wherever he went who was driving this amazingly tacky Jeep they included his name in matching gigantic glittery gold letters that filled his back window. This was truly a masterpiece to be appreciated! “You got me” was all Mr. Loudmouth said with look of disbelief on his face. The way he said it was almost like he was waving a white flag in surrender. But how did the Silent Sisters do it? When did they have time when we were all so busy? And how in the world did they manage to plaster those obnoxious stickers all over his Jeep without anyone noticing? I think the whole salon took a collective breath after we realized that no one was going to lose their job over this little charade but now it was time for the reveal. Our senior stylist is a very laid back guy but I’ve never seen him react like that to a gag. Everyone has a sticking point and I think touching his stuff is his. This guy has been at the salon since the beginning of time so he’s not exactly someone you want to make angry. It was time for the Secret Sisters to let us all in on the joke so we could have a good laugh. It was time to relieve weeks worth of tension. It wasn’t them! They didn’t do it! They were planning on doing something to his car but it was more subtle. The girls had packing peanuts that were saved up in the office. They had talked his assistant into sneaking his keys out of the drawer so they could load his Jeep full of packing peanuts. With the added difficulty of it being across the street and in plain sight they would have to park their SUV on the street to provide cover while getting the job done. They had it all planed. There were rumors circulating that had something to do with peanuts. When everyone got so busy the prank had to be delayed because they couldn’t get him away from his station to get his keys. There was never any mention of stickers. It wasn’t them. The Silent Sisters came clean that they were never scared of ‘getting got’ for April Fools day but that instead they had a plan of attack all of their own. Everyone in the call center had been in on collecting the packing peanuts so that only helped to confirm their innocence. Mr. Loudmouth admitted his whole prank was about making the girls worry and build anticipation to then only shout ‘April Fools’. Both gags were very good and a lot of fun to be a part of but there was still no explanation behind the Jeep. As a show of good sportsmanship and in appreciation to the work that went into the efforts of the joke our senior stylist drove around with the stickers on his Jeep for a couple weeks. He’d smile and laugh when he talked about it, but maybe that was the point behind leaving them on, to make it seem like it didn’t bother him when it really did. Here we are eight years later and no one has ever fessed up to the prank. There have been plenty of other jokes played and cars are still fair game but our senior stylist is not the Mr. Loudmouth he once was. Sure he jokes but he also has his assistant lock all of his belongings up every night before he leaves. 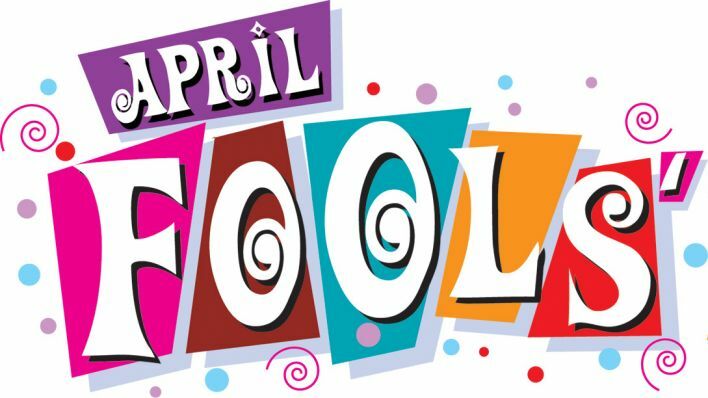 Every year when April Fools day rolls around everyone is prepared and on guard at the salon because without fail this story comes up with no answer of who pulled the best April Fools prank ever.